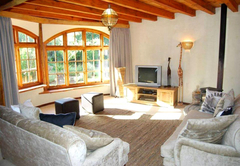 Leh-Lo Guesthouse is a highly recommended property providing self catering in Plettenberg Bay for tourists visiting the Garden Route region. Nestled on a ridge, surrounded by unspoiled indigenous forest, Leh Lo offers superb views and oneness with nature. Bordering De Vasselot Nature Reserve, Leh Lo is part of Kuthumba Nature Reserve. So relax on the verandah and wait for the prolific bird life to come to you. 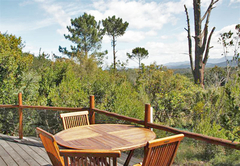 Soak up the sounds of the Vervet Monkeys and Knysna Loerie’s. Hike on Forestry Department trails from your doorstep, through the Tsitsikamma Forest, to the estuary of the Salt River and Nature’s Valley Beach - beautiful, secluded and peaceful. When the light fades, stand in fairy land when surrounded by the fireflies and the silence of the night. 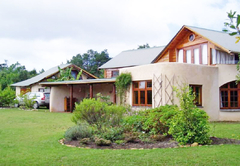 This spacious ecologically designed home lends itself to pure relaxation. This building in itself is worth gazing at for the materials used and extraordinary craftsmanship. The modern yet natural interiors lend to the sense of comfort. With its large undercover verandah that watches over the lawn, enclosed lily pond and indigenous Fynbos, one can unwind completely or watch the kids explore. 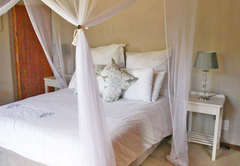 There is a romantic main bedroom upstairs boasting magnificent views of Formosa Peak, from the king size bed, as well as bedroom with two single beds which opens to the coolness and quiet of the forest. These bedrooms share a bathroom with a shower. Downstairs there is a private wing, with a draped queen bed and large en suite bathroom, with bath and outside bush shower. These all look out to the mysteries of the forest. 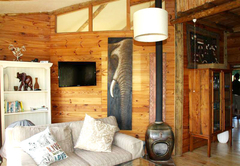 Julay has a large lounge with a wood burning fire place, a TV with limited DStv and a DVD player. The double volume kitchen (fully-equipped) and dining area open through double doors onto the verandah. Coming off the verandah is a sun room with space, away from it all. The ‘fairy tale cottage on stilts’, wrapped on two sides by a wooden deck, has a feeling of peace as one steps through the door. With elevated views of the forest, the bird life is prolific and views stunning. The main bedroom has a queen bed and opens through double doors onto the forest itself, secluded and where you can experience nature. The second bedroom has two single beds and both share a bathroom accessible by both rooms. 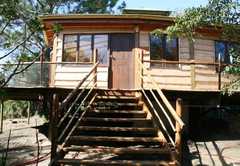 The quaint bathroom has a bath and toilet with views and a wonderful enclosed bush shower. Ever showered with fireflies? Unforgettable! The large open plan kitchen / dining and lounge open through double doors on to the verandah and views, there are windows however that open to incorporate the 180° views. 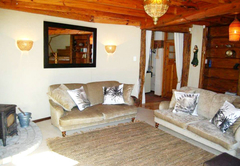 The kitchen is fully equipped and the lounge has a TV with limited DStv and a DVD player. There is an open wood burning fire place for those chilly evenings. 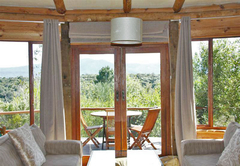 Both Julay and Jispa are fully equipped for self catering. Julay has a scullery and washing machine. You need only bring what you want to eat and drink, books and magazines and don’t forget your camera. Beach towels are not supplied. Weber’s are supplied. Both are serviced before you arrive and after you leave as well as a Wednesday. If you would like daily servicing, it is available at an additional charge per day. Shopping to stock the fridge and larder can be pre-ordered at an additional cost plus the cost of the groceries ordered. Jispa Cottage has 2 bedrooms (one Queen, the other 2 singles) with shared bathroom. 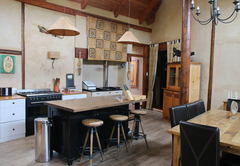 Julay House sleeps 6 people, with 3 bedrooms (King, Queen and 2 Single beds).